In design for users, user testing is often crucial, especially when the designer isn’t already very experienced in the area, or when comprehensive guidelines or heuristics aren’t available. A couple of years ago, I followed some wheelchair-bound people around critique the accessibility of some new buildings that were designed with accessibility in mind. 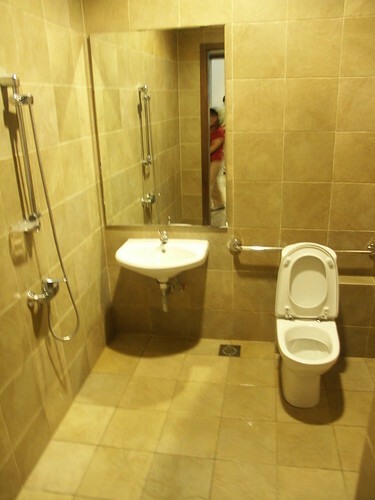 The next picture is of the bathroom at a condominium clubhouse. The picture doesn’t show the handle bar on the right wall beside the toilet, but it’s there. Is this friendly for a wheelchair user? This bathroom is at a rehabilitative hospital, where many of the users are actually wheelchair users. The obvious difference between this bathroom and the first one is that gray plastic seat folded up against the right wall, for a wheelchair user to sit on while having a shower. 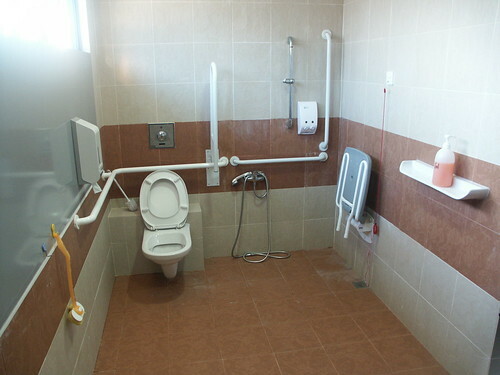 In the first bathroom, the wheelchair user would have to shower the wheelchair as well – not a good idea. The first bathroom was designed with the help of (inadequate) guidelines, while the second one was user-tested. The difference would be glaring to a wheelchair user who wants to shower. And once in a while, you encounter really bad designs. Maybe the users have very long arms. I’m a wheelchair user and that last photo reminds me of a bathroom in the airport in Halifax, Canada. It was great accessibility wise. That is until I tried to wash my hands. The soap dispenser was stuck to the mirror halfway between the counter top and ceiling! 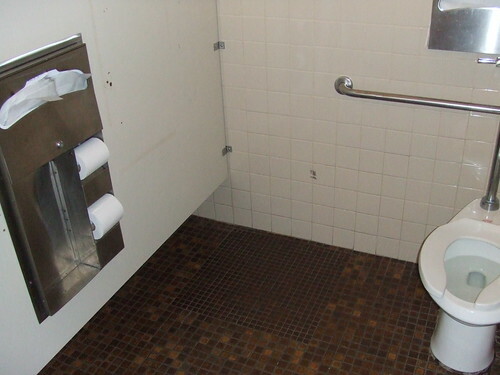 There was also another “accessible” (and I use that term VERY loosly) bathroom at the airport in Toronto, Canada where the toilet papoer roll was so low you had to practically lean ahead and hold your body up with yoru hand against the floor to rech it with your other hand! Nice one Cole. I think the key difference between good design and bad design is a skillful blend of functionality, user-friendliness and aesthetics. Too often, many companies fall prey to the idea that good design must be avant garde, space-age, and super sleek without consideration of the customer experience. coolinsider: what you say reminds me of this article Five Principles to Design By, esp. the section on “Design is not Art”. Kim & Sophie: Thanks for your comment – I never expected real wheelchair users to read this! Your welcome! I can also find numerous other things wrong with the rehab photo too. The shower bench don’t seem to have an arm on either side so people with higher level injuries such as myself wouldn’t be able to stay sitting on the bench to take a shower. Bench seems far away from the wall, and a person would have to lean ahead way too far to reach the hand held shower. Without an arm on the shower bench to hold onto they would probably loose what balance they had and there’s a good chance the person would end up smashing their head off the toilet. It would also be next to impossible for most wheelchair users to use the little shelf to put any shampoo, soap etc. on. (I realize there is a soap despenser on the wall, but let’s face it. Who would want to use that kind of soap for a shower?) The grab bars for the shower are so out of reach that they wouldn’t help in transfering, and even when someone is sitting on the bench (if they have enough balance) there is a rather large gap between the grab bar and bench. The grab bars are all level, but there is no angled bar, making transfering to and from the toilet very hard, or impossible. The toilet paper roll is not in a great position either. Right above the grab bar, and further away from the toilet than it sould be. The long bar between the shower and toilet can fold down , but because this bar comes out from the wall quite a bit then it would be hard for a lot of wheelchair users to reach behind the toilet to flush it. (Also notice that bottom part of the wall behind the toilet is out further than the top making the button to flush the toilet even further away). For anyone with any impairment of their arms, like myself this would be another greatly difficult to impossible task). I’m both shocked and surprised that a rehab center didn’t think of these things! Maybe they are expecting people to use crutches to reach for the toilet paper.